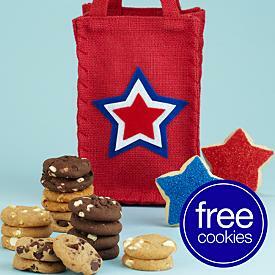 INDEPENDENCE DAY FOOD FACT: The holiday food is associated with red, white and blue foods. This color palette of foods symbolizes the colors in the American flag, and have became popular, as well as traditional. That’s why you’ll find foods such as red hot dogs, red BBQ sauce, red baked beans & red strawberries on the 4th of July menu. 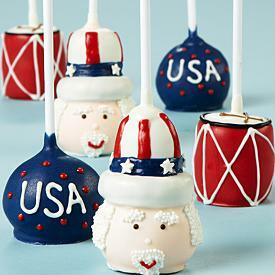 So, let’s get ready for an all-American line up of great food gifts in celebration of America’s Independence! 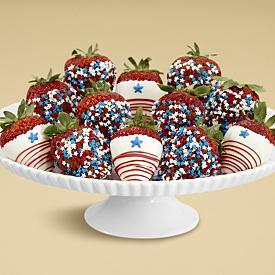 At Shari’s Berries, we found some fabulous, mouth-watering patriotic gourmet food gifts that we think is worth telling you about! As for deserts, you can stay with the themed colors of red, white and blue by preparing homemade desert gifts to bring to an event gathering. 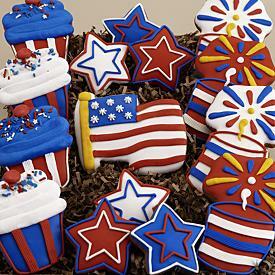 Deserts such as decorated cupcakes, layered cakes or pies can all be decorated or themed the star spangled way. Even drinks can be served in the spirit of the holiday. Red wine, red iced tea and cranberry fruit drink, for example, can be served in glasses wrapped in blue and white ribbon. Another nice gift idea is to bring a nice 4th of July table centerpiece. Some American flags, patriotic star tinsels, and red flowers mixed in with other items make a great do-it-yourself centerpiece project. We hope you have a wonderful 4th of July celebration!